Small group PHOTOGRAPHY TOURS and workshops based in Broome, Western Australia. Our photography tours travel to special locations across the Kimberley like Cape Leveque, Gibb River Road, El Questro and the Bungle Bungles, and many of my Kimberley tours can include an Aboriginal tour experience. My photography adventures focus on wildlife, landscape and nature. 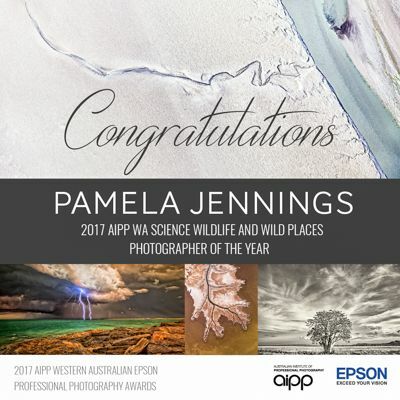 And I was awarded the 2017 AIPP Western Australian Science, Wildlife and Wild Places Professional Photographer of the Year. If you have a sense of adventure, a love of remote areas and a passion for photography, grab your camera and join me. Choose from short tours around Broome or a wonderful 2 or 3 day Cape Leveque Photography Adventure. Got a bit more time, fantastic, join one of my multi day Kimberley Photography Tours that travel from Broome to Kununurra. Landscape and wildlife photography tour in Cairns, Far North Queensland. We like to keep our photography groups small and personalised so we can capture whatever nature throws up at us. It only takes 2 people to confirm a tour and most groups are no larger than 4 participants. Travelling Solo, no problem come along and meet new friends with a passion for photography. Can't find your ideal tour on my website? No worries, we can tailor a photographic experience to suit you. We've added the Pink Lake to our Spring Wildflower Photography Tour in September.